Kargil, located 8,780 feet above the sea level is the second largest town of Ladakh after Leh, situated on the banks of Indus (Suru) river. This town has a population of around 10,657 where most of them are a mix of Dard and Tibetan descent. A major chunk of the population is the follower of Buddhism. It is a transit hub with roads leading to Leh, Padum (Zanskar) and Srinagar. There had been an armed conflict between Indian and Pakistani armies in July 2009, which was known as Kargil war. There a number of monasteries here which even play host to several annual festivals. 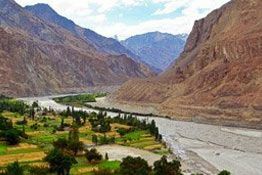 Spanned across 15,000 kilometers of area, Kargil is situated on the banks of the Indus river. 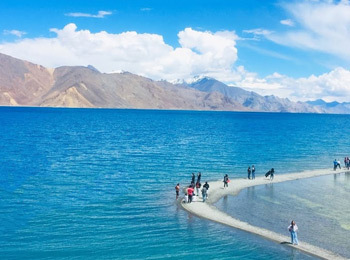 It is located 60 kilometers from Drass and 204 kilometers from Srinagar respectively.It can be reached through 4 wheel drive vehicles and through regular bus services from Srinagar to Leh. The summer season between May to July is the best time to visit Kargil as the temperature is cool with frigid nights. Until 15th August, 1947, before the independence of India, Kargil was a part of the Baltistan district of Ladakh. It is home to diverse linguistic and religious groups. During the first Kashmir war, which resulted in the LOC splitting the Baltistan district and Kargil becoming a part of the Indian state of Jammu and Kashmir. Following the culmination of Indo-Pakistan war in 1971, India and Pakistan signed the Shimla agreement guaranteeing not to engage in armed conflict. In 1999, the area witnessed unethical intrusion by Pakistani troops, who were repulsed by India in the Kargil war. The area which saw penetration is a 160 kilometer long stretch of ridges overlooking the national highway 1. Since the Kargil occupies a significant place in the Indian war history, it attracts a large number of tourists. Also, it is a haven for adventure enthusiasts as they can enjoy adventure sports such as trekking and mountaineering. During the month of may, Kargil plays host to an archery contest. Other major attractions of the Kargil region include Sani, Rangdum, Zongkhul, Stonday and Mulbekh monastery. Built under the patronage of king Kanishka of the Kushan dynasty during the 1st century, Sani monastery is one of the oldest sites in Ladakh. Hotels in Kargil are categorized on the basis of A, B and C. There are two tourist bungalows in Kargil, which together provides 3 suites and 15 well furnished rooms with proper food facilities. You'll have to contact the Kargil tourist office to book accommodation here. There is also a circuit house equipped with 6 furnished rooms and can only be booked through the DC (deputy commissioner) office in Kargil. Buses operate on a regular basis between Srinagar and Kargil. These buses are operated by J&K SRTC. 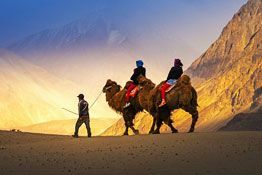 One can also hire taxis including four wheel drive vehicles from Srinagar to Leh.